Electric snowblowers are a quieter and more eco-friendly alternative to gas-powered snowblowers. They're lighter, easier to store, and much easier to maintain that gasoline-powered machines. Whether you need a snow blower to clear a short sidewalk, or a machine to throw deep, 10-inch snow piles from your driveway, electric snowblowers are made in several different ways to meet the needs of various types of homeowners. Electric power shovels are really handy for sidewalks, decks, and patios where snowblowers just won't fit. These lightweight, snow-moving machines don’t have wheels or chutes. Instead, just plug them in and a paddle-style auger pushes the snow forward like a broom. Weighing less than 15 lbs., a power shovel will save your back, however, you'll still get a workout carrying and pushing it around. You'll also have to use it multiple times on a snowy night to keep your driveway clear. These shovels are ideal for light snow less than 4 inches deep in places larger machines can't access. Anything more substantial would be too much for this small, yet handy tool. Want something with a little more power and performance? A corded snowblower is an eco-friendly alternative to gas-powered snow blowers. Unlike power shovels, they feature easy-to-maneuver wheels and a chute to direct the discharged snow. 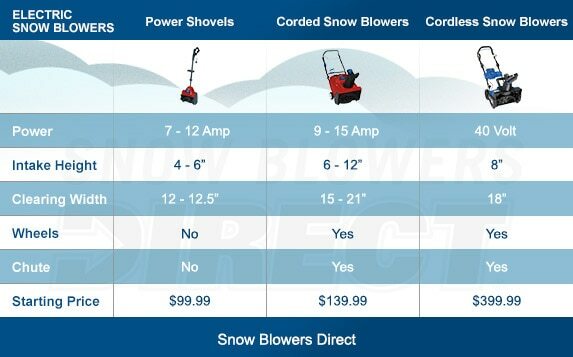 Plus, corded snowblowers feature more powerful motors, throwing up to 700 pounds of snow per minute. They are capable of handling 6-10-inch deep snow. In terms of overall handling and usability, a corded snowblower is a better choice than a power shovel. Electric Snowblower Buying Guide.. Our Power Equipment Direct how-to library can help you learn about Top-Rated & Best-Selling Three-Stage Snowblowers, Farmers Almanac Winter Weather Predictions and Proposition 65 Product Labeling.